Averaging 9.4 ppg (.430 FG%, .392 3pt%, .819 FT%), 2.0 rpg, 1.6 apg and 22.8 mpg in 502 career games (started 209) in eight NBA seasons with five teams - Golden State (2007-08 - 2008- 09), Toronto (2009-10), New Orleans (2010-11 - 2011-12), Chicago (2012-13) and San Antonio (2013-14 - 2014-15). Ranked 5th in three-point field goal percentage (.430) in 2013-14. Played in Italy (2001-2007). ... Selected by Golden State Warriors in first round (18th pick overall) of 2007 NBA Draft ... Traded by the Warriors to the Toronto Raptors for Devean George and cash considerations (7/30/09) ... Traded by the Raptors to the New Orleans Hornets for Julian Wright and cash considerations (8/1/10) ... Signed as a free agent by the Chicago Bulls (7/24/12) ... Signed as a free agent by the San Antonio Spurs (7/11/13) ... Signed as a free agent by the Sacramento Kings (7/13/15). Averaged 9.2 ppg (.423 FG%, .374 3pt%, .848 FT%), 2.5 rpg, 1.5 apg and 22.4 mpg in 61 games (started 9) ... Missed eight games (11/6-11/19/14) with a mild strain in his right groin ... Missed 11 games (1/10-1/31/15) with a mild strain in his left groin ... Missed one game (4/8/15) with tightness in his left groin ... Scored in double-figures 28 times, including three games with 20 or more points. Top Single-Game Performances: Opened the season with 15 points (5-8 FG, 3-6 3pt, 2-2 FT), three assists and two rebounds in 31 minutes vs. Dallas (10/28/14) ... Posted 11 points, a season-high seven rebounds and three assists in 31 minutes at Philadelphia (12/1/14). Averaged 11.4 ppg (.485 FG%, .430 3pt%, .847 FT%), 2.8 rpg, 2.2 apg, 25.2 mpg in 80 games (started 25) ... Posted career-highs in rebounds and assists per game and eld goal and three-point eld percentage ... Ranked 5th in the NBA in three-point eld goal percentage ... Became the first Spurs player in franchise history to win the NBA Foot Locker Three-Point Contest ... Recorded three games with five or more three-pointers made ... Scored in double-figures 49 times, including seven games with 20 or more points and one game with 30 or more ... Had a career-long streak of 10 games scoring in double-figures (2/3-2/28/14) ... Led team in scoring nine times, rebounding once, assists four times and steals nine times. Top Single-Game Performances: Posted a career- high 32 points (12-16 FG, 6-9 3pt, 2-2 FT), five rebounds and two assists in 33 minutes vs. New York (1/2/14)... Posted 28 points (10-16 FG, 4-8 3pt, 4-4 FT) in 29 minutes at Golden State (12/19/13) ... Recorded 16 points (6-12 FG, 2-4 3pt, 2-2 FT), a career-high 11 rebounds and a career-high tying eight assists in 36 minutes at Boston (2/12/14) ... Distributed a career-high tying eight assists in 27 minutes vs. Washington (11/13/13). Averaged 9.6 ppg (.395 FG%, .357 3pt%, .839 FT%), 1.9 rpg, 2.0 apg and 25.8 mpg in 73 games (started 27) ... Missed seven games with an abdominal strain (3/24-4/05/13) and one game with a right ankle (2/7/13) ... Spent three games on the team’s Inactive List due to injury and recorded one DNP- CD ... Led the team in scoring 10 times and in assists twice ... Scored in double-figures 29 times, including seven games with 20 or more points. Top Single-Game Performances: Posted 22 points (8-15 FG, 4-6 3pt, 2-2 FT) and grabbed four boards vs. New York (12/8/12) ... Made a career-high 11 free throws and scored 22 points at New York (12/22/12). Averaged a career-best 11.8 ppg (.417 FG%, .377 3pt%, .783 FT%), 2.6 rpg, 1.5 apg and 29.8 mpg in all 66 games (started 55) ... One of only three Hornets to play in all 66 games ... Led the team in scoring 10 times and in rebounding twice ... Led the team with 107 three-pointers and with 44 double-digit scoring performances ... Had nine games with 20-plus points and one game with 10 or more rebounds. Top Single-Game Performances: Tied his then-career high with 27 points and set a career-high with seven treys at Portland (3/29/12) ... Led the team with 22 points and added a career-high tying six assists at Golden State (3/28/12) ... Recorded a career-high 10 rebounds to go along with eight points and two steals vs. Phoenix (12/30/11). Averaged 10.5 ppg (.437 FG%, .414 3pt%, .784 FT%), 1.9 rpg, 1.2 apg and 24.5 mpg in 80 games (started 69) ... Led the team in scoring once and tied for the team lead three times ... Scored in double-figures 44 times ... Surpassed the 20-point mark four times ... Opened the season with 18 points and six rebounds vs. Milwaukee (10/27/10) ... Missed two games with a sprained right ankle. Top Single-Game Performances: Scored a season-high 23 points (8-13FG, 5-8 3pt, 2-2 FT) vs. Boston (3/19/11) ... Tallied 14 points, four assists, two rebounds and two steals at Utah (3/24/11) ... Scored 16 first-quarter points (tied for the most by a Hornet in a quarter that season) and finished with 18 points at Memphis (4/10/11). Averaged 7.1 ppg (.406 FG%, .380 3pt%, .835 FT%), 1.4 rpg, 1.3 apg and 17.0 mpg in 66 games (started 1) ... Missed six games due to injury and subsequently was placed on the Inactive List for six games ... Registered 10 DNP-CDs Scored in double-figures on 21 occasions ... Led the bench in scoring 22 times. Top Single-Game Performances: Finished with a season-high 21 points (7-13 FG, 3-4 3pt, 4-5 FT) and five rebounds at Indiana (2/2/10) in his lone start of the season ... Recorded 19 points (8-14 FG, 3-5 3pt) and three assists at Atlanta (12/2/09) ... Posted 15 points (6-8 FG, 1-2 3pt, 2-2 FT), five rebounds and three assists at Chicago (12/5/09) ... Posted 16 points, five rebounds and two assists vs. Milwaukee (1/22/10) ... Finished with 14 points (5-8 FG, 3-3 3pt, 1-2 FT) in the season finale vs. New York. Averaged 8.9 ppg (.442 FG%, .397 3pt%, .769 FT%), 1.7 rpg, 2.1 apg and 21.0 mpg in 42 games (started 23) ... Missed 23 games with a sprained right ankle (3/20-4/1, 1/14-2/12/09) ... In 23 starts, averaged 11.3 ppg, 2.1 rpg and 2.9 assists ... In 21 contests when playing at least 20 minutes, averaged 13.4 ppg, 2.7 rpg and 3.2 apg ... Scored 10 or more points 18 times and 20 or more points four times. Top Single-Game Performances: Netted a then-career-high 27 points (11-21 FG, 3-10 3pt, 2-3 FT), six assists and three rebounds at Atlanta (12/19/08) ... Preceded that with a 21-point (8-16 FG, 5-8 3pt), four-rebound and four-assist outing at Indiana (12/17/08) ... Recorded 23 points (6-12 FG, 5-8 3pt, 6-6 FT) and six rebounds vs. Toronto (12/29/08) ... Tallied 22 points and four assists vs. Boston (12/26/08). As a rookie, averaged 2.9 ppg (.387 FG%, .390 3pt%, .778 FT%), 0.4 rpg, 0.5 apg and 7.3 mpg in 33 games off the bench ... Was on the Inactive List for 22 games ... Drew a DNP-CD 27 times ... Scored in double-figures two times. Top Single-Game Performances: Tallied a season-high 17 points (6-10 FG, 5-6 3pt) vs. Seattle (4/16/08) ... Netted 13 points, four rebounds and two assists at Memphis (4/4/08). In 48 career playoff appearances, averages 7.9 ppg (.425 FG%, .383 3PT%, .903 FT%), 2.2 rpg, 1.3 apg, in 20.2 mpg ... During the 2013-14 San Antonio championship run, averaged 5.4 ppg and 2.3 rpg. 2014: Tied playoff career-high with seven rebounds twice at Portland (5/12/14) and vs. Oklahoma City (5/21/14) ... Opened the NBA Finals with nine points (2/3 3pt, 3-4 FT), two rebounds and an assist vs. Miami (6/5/14). 2013: Saw action in all 12 playoff games for the Bulls, averaging 11.1 ppg, 3.2 rpg, 2.8 apg and 29.5 mpg ... Recorded six games with 10 or more points ... Posted back-to-back 20-plus point games in Games 6 and 7 vs. Brooklyn in the first round of the NBA Playoffs ... Recorded 22 points, seven assists and five rebounds in Game 6 ... Followed that up with 24 points (8-14 FG, 3-6 3pt, 5-5 FT) and six rebounds in a decisive Game 7 win ... Tallied 16 points and six assists in Game 3 at Miami in the Eastern Conference Semi-finals. 2011: Played in six playoff games vs. L.A. Lakers, averaging 9.7 ppg in 28.8 mpg ... Scored 21 points (8-14 FG, 3-5 3pt, 2-2 FT) in 39 minutes at L.A. Lakers (4/26/11). 2006-07: Appeared in 33 games in Serie A play, averaging a career-high 16.4 ppg (.544 FG%, .338 3pt%, .760 FT%), 1.7 rpg, 1.3 apg and 2.20 spg ... In 13 Euroleague contests, tallied 12.9 ppg, 1.9 rpg and 1.3 apg. 2005-06: Saw action in 47 Serie A contests and averaged 13.2 ppg, 1.3 rpg, 1.7 apg, and 27.9 mpg ... In 19 Euroleague contests, averaged a personal Euroleague-best 13.2 ppg, 1.6 rpg, 1.0 apg, 1.42 spg and 27.7 mpg ... Shot .530 from the eld and a career-best .439 from long range. 2004-05: Helped lead Fortitudo Bologna to an Italian League title and the Italian Cup, playing in 45 Serie A games and posted 6.5 ppg ... Appeared in 20 Euroleague contests, averaging 4.2 ppg, while shooting .606 from the eld. 2003-04: Appeared in 34 Serie A games and posted 4.5 ppg ... Saw action in 16 Euroleague contests, averaging 3.0 ppg. 2002-03: In first professional season, appeared in 16 Serie A games and recorded 2.6 ppg ... Also averaged 5.6 ppg in eight Euroleague outings. 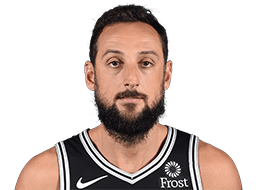 Name is pronounced Mark-o bell-uh-nell-ee ... Full name is Marco Stefano Belinelli ... Born on March 25, 1986, in San Giovanni in Persiceto, Italy ... Nicknamed “Beli” by his childhood friends ... Attended the 2007 NBA Draft in New York, marking his first trip to the United States ... Obtained a driver’s license for the first time in his life in the summer of 2008 ... Did not drive in Italy or during his rookie season in the NBA ... Says that if not playing professional basketball he would work in the fashion industry ... Has a personal website, http://marcobelinelli.it.